6.1 million ha of forests and peatland are “stranded assets” on the balance sheet of Indonesian palm oil companies as they cannot viably be developed. 95 identified palm oil company groups – 35 of which are publicly traded – each holds at least 1,000 ha of stranded land within their concessions. 29 percent of Indonesia’s leased-out landbank cannot be developed without violating buyers’ policies. 10 percent of Indonesia’s total land has been leased for oil palm concessions in the last 25 years. Four detailed case studies presented: Noble Group, Eagle High Plantations, Provident Agro and Tadmax. Published by Chain Reaction Research, and written by Eric Wakker, Aidenvironment; Milena Levicharova, Profundo; and Gabriel Thoumi, CFA, FRM, Climate Advisers. 6.1 million ha of forests and peatland are “stranded assets” on the balance sheet of Indonesian palm oil companies as they cannot viably be developed. This magnitude is potentially unknown to investors and bankers. Analysts may be mispricing these stranded assets into current financial valuations. 29 percent of Indonesia’s leased out landbank cannot be developed without violating buyers’ No Deforestation, No Peat, No Exploitation (NDPE) policies. This stranded land is equal in size to 10 million football fields. NDPE compliant growers may enjoy wider, more secure markets and be able to sell at higher prices. This could render a full transition to NDPE imminent. With 365 NDPE policies from traders and consumer goods companies, and new regulations from the government of Indonesia, analysts need to change their financial modeling techniques to include stranded asset discounts. Due to stranded assets, the Indonesian palm oil industry may be facing a trend of lower growth and equity revaluations. Banks may be left with poor loan collateral when the underlying oil palm concession is recognized as stranded land. Risks and costs for companies and credit and equity investors are likely to increase. This means that landbank expansion – regardless of location – is a high-risk financial strategy. To mitigate business risk, companies may want to focus on improving growth and yield, achieving buyer NDPE policies and alternative growth strategies instead of risky landbank expansion. Only companies that comply with NDPE policies by refraining from developing forests or peatland will retain access to the market segment that demands sustainable production. This segment is quickly becoming mainstream and offers better CPO trade terms. Three out of every 10 ha leased to oil palm concessions in Indonesia is stranded land. This land cannot be developed without violating buyers’ No Deforestation, No Peatland, No Exploitation (NPDE) policies. This undevelopable land area is the same size as 10 million football fields. Four trends are driving this supply chain transformation. Trend #1: Undeveloped palm oil landbanks are no longer a viable proxy for financial valuation. Traditionally, a palm oil company’s undeveloped landbank is a key factor in its financial valuation. Landbanks are used to determine a company’s projected future net earnings and share price. However, under current market conditions, undeveloped forested and peatland cannot generate any future value without violation of NDPE policies. Trend #2: 365 companies globally have adopted zero-deforestation or NDPE policies. Included in this group are 25 of the largest palm oil traders and refiners. Some of these traders and refiners have suspended or excluded non-compliant growers from their supply chains because of unwillingness to stop deforestation and/or peatland development. As a result, non-compliant palm oil companies find themselves excluded from selling downstream to these companies if they do not comply with their procurement policies. Examples of growers who were suspended include: IOI Corporation (OTC:IOIOF), Austindo Nusantara Jaya, Sawit Sumbermas Sarana and Provident Agro. Regardless of the legal rights growers may have, palm oil buyers have also suspended growers when they violate buyers’ zero-deforestation commitments. Trend #3: The government of Indonesia is directing the palm oil industry away from deforestation and peatland development to improving growth and yields. President Jokowi recently issued a revised regulation on the protection of peatland. This revision comes in addition to the twice-extended forest-clearing moratorium and a five-year ban on new oil palm concessions. As expressed by President Jokowi, the government of Indonesia wants to increase growth and yield at existing plantations as opposed to expand plantations via deforestation and peatland destruction. Since 2013, refiners and traders including Wilmar International (OTCPK:WLMIY), Musim Mas, Golden Agri-Resources (OTCPK:GARPY), Apical, IOI Corporation and ADM have publicly released their lists of direct and third-party suppliers to their CPO mills. Based on analysis of these supplier lists, it is estimated that Indonesia has 900 CPO mills. These CPO mills purchase Fresh Fruit Bunches from a variety of sources including the mill’s own plantations, third parties, and nearby smallholders. Indonesian palm oil concession leases on public land are for 35 years in the first rotation. These leases are repeatedly extendable by 25 years. Similar techniques yield comparable results. Other estimates for the total palm oil plantation landbank in Indonesia are 15 million ha excluding plantations less than five years old and areas planted by smallholders and companies beyond available concession maps. In 1990, one million ha in Indonesia was planted with palm oil. As shown below in Figure 3, in the last 25 years, an additional 10 percent of Indonesia’s land surface area has been allocated to palm oil. The first category is accessible concessions with peat. Peat development is now prohibited by recent legislation that declared an extended moratorium on all peatland development. There are 1,532,364 ha of peat that is stranded land. The second category is concessions with remaining forest cover, usually located further inland. Deforestation in these concessions will likely trigger intervention and suspension by traders and refiners and downstream buyers. There are 3,505,012 ha of forest that is stranded land. The third category is peat forest. 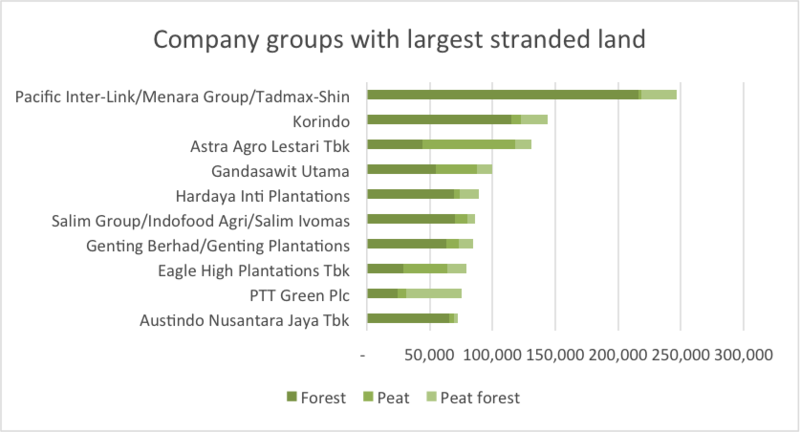 There are 1,086,881 ha of peat forest that is stranded land. Kalimantan: As shown above in Figure 5, despite Kalimantan’s palm oil expansion over the last 15 years, the region has significant stranded land. Sumatra: As shown above in Figure 5, little undeveloped land remains inside current concession areas in Sumatra, where massive plantation development commenced in the 1990s. What land remains is foremost undeveloped peat and possibly some High Conservation Value forests in concession areas of RSPO members. This does not mean that development in Sumatra has consolidated. The island has seen significant unregulated expansion by smallholders who occupy land outside concessions. This has resulted in the loss of large areas of forest and peatlands. Papua: As shown above in Figure 6, Indonesia’s last frontier in Papua contains significant stranded land. Plantation development in Papua has become intensely contested resulting in several companies having let their legal concession rights lapse while others were forced to suspend their deforestation activities. In some instances, companies cleared enough land to run a viable CPO mill whilst others were forced to stop well before reaching their financial break-even point. Sulawesi: As shown above in Figure 6, limited areas on Sulawesi are suitable for oil palm trees in the intact forests in Gorontalo Province. These areas may already be considered stranded land as buyers and investors have already taken action to prevent further clearance. Analysis shows that 95 company groups, 35 of which are publicly traded, each have at least 1,000 ha of stranded land. 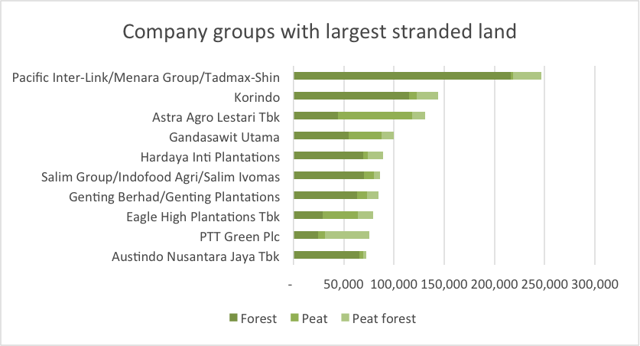 As shown below in Figure 7, the 10 company groups with the largest stranded landbanks jointly account for 1 million ha. Stranded land may lead to negative operational and financial impacts. When a concession continues to develop its landbank contrary to buyers’ NDPE policies, its buyers may suspend it, resulting in material revenue at risk. But when a concession accepts that remaining forest and peatland can no longer be developed, it may lose potential future net income from each stranded land ha over the length of the lease. This means that investors may find that projected return on investment decreases from stranded land as overall yields decrease. The extent of negative impacts is determined by the operational status of the concession. Company groups such as Dharma Satya Nusantara in West Kalimantan and Papua, Provident Agro in Sulawesi, and Musim Mas in Papua may have to forfeit concessions that are fully covered in forests or located on peat. Direct cost incurred remains limited to surveys fees and acquisition of usufruct rights from local communities. There are no sanctions for letting permit terms lapse, but sale of concession rights, in full or in part, is not allowed. The impact of stranded land is higher when ongoing land development has to be suspended prior to achieving an investment’s hurdle rate or operational break-even point. This might prevent a CPO mill from becoming viable. This occurs in Papua because larger concessions are required for a plantation project to be financially viable. When High Carbon Stock (HCS) forest and peat surveys confirm that further expansion would violate NDPE policies, then investors would have to write off all expenses related to land acquisition, land clearing, seeds and planting. In Papua, Eagle High Plantations, Goodhope and Noble Group face such impacts. Companies that had developed their landbanks before NDPE policies came into force in 2014 can operate CPO mills but must refrain from additional land development. For the remainder of their landbank, they may be forced to forfeit their concessions. Companies to whom this applies include Korindo, Golden Agri-Resources and Genting Plantations. Access to high value markets to the largest 25 traders. Better relations with investors, bankers, buyers and civil society. Minimizes risk of future stranded land impacting financial performance. Producer guarantees and the exposure to a wide client pool and competitive market conditions. The downside of complying with NDPE policies is that plantation groups may be left with stranded land. As shown in Figure 8 below, stranded land has specific investor impacts and multiple financial consequences. Reduced earnings growth. NDPE policies mean the criteria for achieving profitable investments in new concessions need to be scrutinized. As a result, landbank expansions no longer equal earnings growth. Unjustified capital expenditures from the purchase of concession rights, infrastructure development, land clearing, purchase of seeds and new plantings. When permits are declined or companies are excluded from NDPE covered supply chains, these expenses are unjustified. This may further suppress earnings margins and free cash flow resulting in decreasing shareholder value. Increased cost of equity and debt. Stranded land used as loan collateral may result in creditors perceiving the company as riskier. This may tighten their liquidity and solvency requirements. Credit investors may raise their required interest rates to compensate for these additional risks. Upward change in cost of debt could increase the weighted average cost of capital too, thus potentially reducing the value of the entire enterprise. Reduced free cash flows and profits. The potential revenue and earnings which land can generate is determined by the expected cash outflows and cash inflows over a certain horizon. Any remaining free cash flow becomes earnings available to be dispersed to investors. 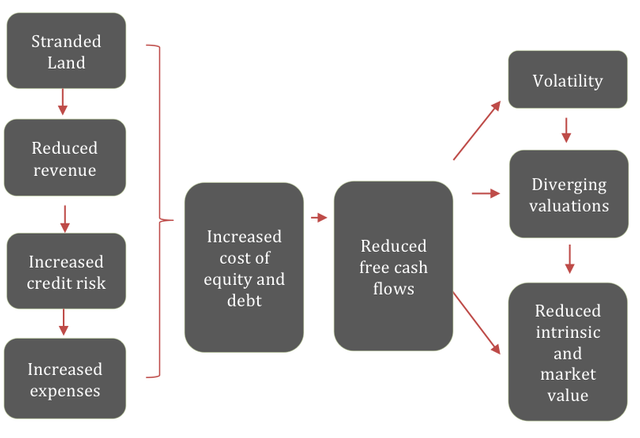 A discounted cash flow model can show how much present value can be derived from land, and hence the impacts of stranded land on the company’s value. 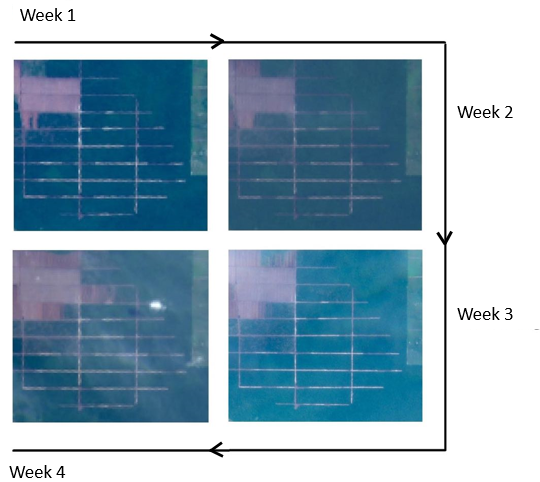 As shown below in Figure 9, four case studies are presented that illustrate the negative operational and financial impacts from stranded land on palm oil companies. Figure 9 above shows the absolute and relative figures of stranded land for each listed company and contrasts its per share value of Free Cash Flow to Equity (FCFE). The estimates are presented in absolute terms and as a percentage of current share price. As some companies trade at a premium or discount to their intrinsic value, their market capitalization may not represent the present value of their potential free cash flow. Market capitalization may also accommodate further information, such as operational and financial risk discounts. Assuming this to be the current status quo and that the market has efficiently priced in other information, the analysis shows that the four companies Tadmax, Noble Group, Provident Agro, and Eagle High Plantations are likely to experience share price adjustments due to stranded land. NDPE is likely to soon dominate the palm oil industry, eventually establishing a more sustainable market. During this period of transition, NDPE compliance may mean higher prices for NDPE products. The industry may be facing a period of slower organic revenue growth due to inability to develop non-NDPE compliant landbanks. A period of company revaluations to adjust for any stranded land may occur. Increased volatility caused by companies’ uncertainty by how they approach this NDPE transition may lead to reduced equity returns. Change in the appreciation of future land acquisitions may evoke demand for increased transparency with regards to the quality of new land prior to any positive company revaluations. The Tanah Merah Project (Project) consists of seven related concessions. It is operated by a network of individuals from Malaysia, Kuwait and Indonesia, including former police and army officers. The Project represents the single largest current threat to Indonesia’s forests. Should the Project succeed, the companies involved will enter the ranks of Indonesia’s medium-sized oil palm growers. The Project might also cause leakage by using Pacific Inter-Link’s refineries to produce products to sell in countries with less concern for the palm oil industries’ negative environmental and social impacts. Analysis shown below in Figure 10 and Figure 11 demonstrates that the Project may not succeed in acquiring and developing its six concessions totaling 273,394 ha. This is because the concession is subject to Indigenous Peoples’ customary rights. As a result, Pacific Inter-Link and other refiner-traders may only be able to sell the Project’s palm oil products at significant discount. While the Project might generate income from timber sales, this would increase the risk that Indonesia’s Corruption Eradication Commission (KPK) will take action. Key Markets and Buyers Pacific Inter-Link: Africa, China, and Ukraine. Buyers include Ulker (Turkey) and Mohammed Enterprises Tanzania Ltd.
Tadmax, a publicly traded company, is involved in the Project. Currently, its share price does not correspond to the intrinsic valuation of all potential cash flows that its land assets can generate. While palm oil products are less than 40 percent of its revenue, 31 percent of its oil palm concessions can be considered stranded land. Even if this happens and is at the expense of diminished profit margins, it would not last long. The transition of the entire Indonesian palm oil industry to NDPE is advancing fast, making this window of opportunity narrower by the quarter. From an investor perspective, Tadmax’s stranded land represents an investment that cannot pay off. If Tadmax could return 10 percent FCFE on the potential CPO revenue it could source, this might support its share price at MYR 1.40 or higher vs. its current price of MYR 0.36. Therefore, its stranded land equals 400 percent of its price. Menara is a consortium of 28 unlisted companies that may not be able to generate likely envisioned free cash flows of IDR 948 billion. Credit investors should be aware that 38,607 ha are of little to no value for the company and are therefore poor collateral or source of cash flows. Pacific Inter-Link too may not be able to generate likely envisioned free cash flows of IDR 4,000 billion. Credit investors should be aware that 159,239 ha are of little to no value for the company and are therefore poor collateral or source of cash flows. The present value of the estimated FCFE which arrives from Tadmax’s 31 percent stranded land is nearly four times the company’s current market value. While this suggests that its market capitalization is not on par with its intrinsic value, investors should be aware that no future growth can be expected to stem from a third of the company’s oil palm land, its book value may be overstated and it cannot used as reasonable collateral. As shown above in Figure 12, in Papua, Eagle High Plantations has an area of 33,694 ha under concession. After a report was published in 2015 that showed the clearing of 500 to 1,000 ha of HCS forest on PT Varia Mitra Andalan’s 20,318 ha concession, Eagle High Plantations’ main buyers Golden Agri-Resources and Cargill intervened. In response, Eagle High Plantations stopped land development on this concession resulting in 18,926 ha as stranded land. In Kalimantan, Eagle High Plantations has invested in a 303,788 ha landbank. As shown below in Figure 13, Eagle High Plantations’ PT Arrtu Energi Resources 18,240 ha concessions – on two locations – is 50 percent stranded land. One of the locations (11,842 ha) has been developed for 4,557 ha, leaving 7,285 ha (61.5 percent) as stranded land. The amount, however, of Eagle High Plantations’ stranded land has already been described in the public media during the recent Malaysian government’s Federal Land Development Authority (FELDA) $505.4 million investment for 37 percent stake in Eagle High Plantations. FELDA is purchasing this non-controlling stake from the Rajawali Group. FELDA, the Malaysian government entity, also owns 33 percent of Felda Global Ventures. To summarize, Eagle High Plantations is facing top-line challenges from stranded land. Given that the market knew of these land issues when the 37 percent FELDA investment occurred, stranded land information may already be priced into Eagle High Plantations’ current share price. Alternatively, the value of potential future cash flows from this stranded land, estimated at USD 213 million (IDR 3,000 billion), is equal to 41 percent of Eagle High Plantation’s current share price. This implies Eagle High Plantations’ shares may adjust downwards. In 2014, Provident Agro acquired two concessions in Sulawesi with a total area of 18,000 ha. These concessions are fully covered with primary or regenerated logged forest. Potential deforestation of these concessions was a direct violation of buyers’ NDPE policies. Consequently, in 2015, Golden Agri-Resources suspended buying from Provident Agro because it breached its NDPE policy. This breach together with NGO attention has put the planned developments of its two Sulawesi concessions on hold. Currently, no land development is observed. Such developments are a clear example of the growing importance of NDPE polices and the outcomes which less sustainable companies face. During the same period, Provident Agro invested USD 31.75 million in two new mills located in South Sumatra and West Kalimantan to begin refining palm oil by the end of 2015. But, in 2016, the company announced the sale of four plantations in Kalimantan to pay down its debt and to increase capital. As a result, in 2016, Provident Agro’s expected production for the entire company was forecasted to decline 40 percent. This increases revenue-at-risk. In such a position, the prudent course of action would be for Provident Agro to secure revenue certainty by complying with buyers’ NDPE policies. But there is a tradeoff. NDPE policies could also have a negative impact on the company’s share price. Pursuing NDPE buyers might make more than one third of its concessions strand land. This would decrease Provident Agro’s revenue. The expected future cash flows for the company would thus be also reduced. Recognizing stranded land can have a negative impact on the company’s market valuation, even if it diverges from its intrinsic value. Historically, Provident Agro has been able to return 11 percent of its revenues as FCFE. With its capacity and estimated cost of equity of 8.7 percent, the present value of Provident’s stranded land is USD 45 million (IDR 603 billion). Given that the market may not be unaware of Provident’s large exposure to stranded land, it is possible that Provident Agro might face a reduction in its share price. Per share FCFE is estimated at USD 0.01, or IDR 85. This is nearly 20 percent of its current equity price. It is uncertain how best to value the company given its risk exposures. This is likely why analysts have divergent valuations. This itself can lead to further volatility and possibly amplify risks for investors. Major Investors Noble Resources Pte. As shown above in Figure 16, Noble Group’s Noble Plantations has invested in two concessions in Papua, which have been halted by market interventions against further land development. At present, a total of 27,719 ha of the two concessions have been developed. Earlier in 2016, the Norwegian Pension Fund KLP divested from Noble Group. However, 23 global banks, including eight RSPO members, recapitalized Noble Group with a USD 1 billion loan. In both concessions, shown below in Figure 17 and Figure 18, the remaining land will become stranded land because of buyers’ NDPE policies. The cleared areas allow for CPO mill construction. But given the cost of operation in Papua, profit margins will be limited. Noble Group has not yet formally disclosed land that it may have to strand given NDPE policies becoming the industry norm. But this has been disclosed in other public files including a RSPO complaint and a recent Chain Reaction Research report. While Noble Group might have to reassess negligible amounts in relative terms, estimated Free Cash Flows to Equity of SGD 105 million might not be realized. The book value of the land may also be overpriced. This impacts its exit strategy because Noble Group intends to sell palm oil assets. While these assets constitute less than 1.5 percent of Noble Group’s equity, these assets’ FCFE as percent of its share price is 4.5 percent. Merging data from BPN (National Land Agency), Disbun 2016, Greenpeace, Ministry of Forestry forestland release maps (Pelepasan Kawasan Hutan), and RSPO New Planting Procedure (NPP) documents and other Indonesian government data enabled the compilation of an aggregate oil palm concession map. For the land use/land cover and peatland data from the Ministry of Forestry (Forest cover 2013), Wetlands International Indonesia and Ministry of Agriculture (Kementan) 2012 data were used. The oil palm planted land map was compiled using ESRI and ArcGIS software. Average CPO yield per ha is assumed at four tons. This is Indonesia’s historical average. The average production of an oil palm tree during productive age three to 25 years is 3.8 tons per ha. But replanting and increase in productivity due to technological advancement justifies the use of four tons as average or higher. The recent high CPO prices are used as the forecast price: SGD 900 a ton, IDR 8,500,000 a ton and MYR 2,800 a ton. Thus potential future cash flows can be estimated as number of ha times four CPO tons per ha times price. Concessions are assumed held for 35 years. This is the average for land with an Indonesian cultivation permit (HGU). A concession can be renewed afterwards with land processing commencing within six years of permit issuance. The cost of equity for each individual company is used to discount future cash flows. Plantation development is assumed to be all equity financed, so that a comparison of cash flow per share with current equity price can be made. The source of the cost of equity estimates is Bloomberg. Historical average Free Cash Flows to Equity (FCFE) as percent of revenue is calculated for each company. This allows for estimating what percentage of future revenue can be free cash potentially dispersed to shareholders. Historical FCFE figures are taken from Bloomberg. Cash flows from Fresh Fruit Bunches harvesting may be possible in five years’ time, allowing for usual hurdles such as securing permits, developing infrastructure, planting and waiting for palm trees to reach maturity. Prior performance is no guarantee of future performance. Forecasting a 35-year horizon is subject to numerous exogenous factors, which have been ignored for simplicity. Companies involved in growth seeking strategies shown via their capital expenditures might exhibit FCFE which are not representative of a “business as usual scenario”. Therefore, alternate assumptions are made, e.g. revenue can be converted to 10 percent FCFE by the average firm. FCFE as a percent of revenue was selected over net income margin. It is more representative of cash flows available to equity investors after allowing for needed reinvestment in operations. One alternative to this model is analyze stranded land as an investment project with positive net income. In this alternative, cash outflows would be estimated as “cash flows times (1 – net income margin)”. Another alternative would be to apply Free Cash Flow for the Firm (FCFF) and use the weighted average cost of capital for the firm. In the case of market capitalization trading close to intrinsic value, FCFC per share may be indicative of potential futures losses, i.e. FCFE as percent of share price. Divergence of intrinsic value from company market value makes FCFE as percent of share price possibly a poor indicator of future performance. This is because it is only shown to put the effects in relative perspective. For companies where stranded land information is already widely available in the public domain, some share price adjustment can still be expected as NDPE’s importance and awareness are growing. For companies where stranded land information is not already widely available in the public domain, markets may be expected to move in negative direction. Disclaimer: This report and the information therein are derived from selected public sources. Chain Reaction Research is an unincorporated project of Aidenvironment, Climate Advisers, and Profundo (individually and together, the “Sponsors”). The Sponsors believe the information in this report comes from reliable sources, but they do not guarantee the accuracy or completeness of this information, which is subject to change without notice, and nothing in this document shall be construed as such a guarantee. The statements reflect the current judgment of the authors of the relevant articles or features, and do not necessarily reflect the opinion of the Sponsors. The Sponsors disclaim any liability, joint or severable, arising from use of this document and its contents. Nothing herein shall constitute or be construed as an offering of financial instruments or as investment advice or recommendations by the Sponsors of an investment or other strategy (e.g., whether or not to “buy”, “sell”, or “hold” an investment). Employees of the Sponsors may hold positions in the companies, projects or investments covered by this report. No aspect of this report is based on the consideration of an investor or potential investor’s individual circumstances. You should determine on your own whether you agree with the content of this document and any information or data provided by the Sponsors.